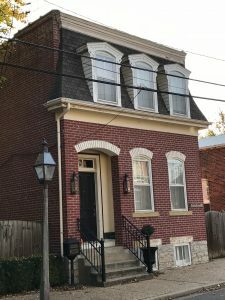 Shhhh…we hesitate to blog about St. Genevieve, Missouri-what some call the best example of French Colonial architecture in the hemisphere! You see, the whole town is slated to become a National Historic Park and crowds haven’t discovered it yet! We debated about whether it is fair to keep this charmingly romantic and historic town to ourselves. 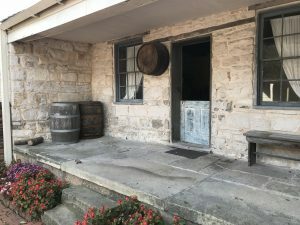 An hour south of St. Louis, St. Genevieve is the oldest town in Missouri and was founded by French Canadian fur trappers between 1722 and 1749. Officially, St, Genevieve became a town in 1735 and was the first organized European settlement west of the Mississippi in Missouri. Jacques-Nicholas Bellin’s map of 1755 showed the Kaskaskia native tribe on the east side of the river but no Native American village on the west side within 100 miles of St. Genevieve. We spent a whole day wandering the quiet streets and searching out the historic houses and buildings that comprise this treasure of a place. The oldest buildings in St. Genevieve are what is called, “French Creole colonial” in style. Most were constructed with vertical wooden logs and posts either dug into the ground (called poteaux en terre) or set on a raised stone or brick foundation (called poteaux sur solle). Think about the historic log cabins you have seen-they have the logs stacked horizontally instead of vertically like the ones you will see in St. Genevieve. Three of the five surviving poteaux en terre houses in America are located in St. Genevieve! There is another in Pascagoula, Mississippi and one near Natchitoches, Louisiana. We didn’t know very much about French Colonial culture. Fascinatingly, the people farmed land held in common in a large field. The land was assigned to people and cultivated in the old French way, with long, narrow strips extending back from the river to the hills so that each settler had some waterfront. The field is called the Grand Champ (“Big Field”) and is still there! This field was first planted in approximately 1750 and is among the oldest continuously farmed plots of land west of the Mississippi. The French colonists were followed by Germans after the Louisiana Purchase in 1804 so the town has fine examples of 1880s architecture too. …over the years they were made to look like any other kind of house, wrapped in weatherproof vinyl siding, topped with an extra story, fitted with plumbing and electricity, and punctured with new windows, Some people don’t realize they’re living in a 200-year-old cabin until they pull down the drywall and see the trimmed trunks of trees. 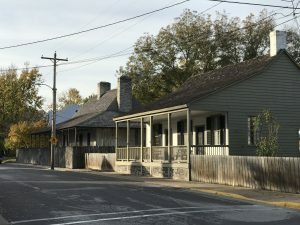 Historians are now saying that the town of St. Genevieve comprises one of the largest collections of French Colonial architecture in the United States. A report written by the National Park Service concluded that St. Genevieve is on par with Savannah, Georgia and civil war battlefields in historic importance. Nobody knows how many people are buried in the old cemetery here. Estimates go as high as 5,000-more than the city’s current population. There are French traders, former slaves and their former owners, the daughter of a Native American chief, German immigrants, the victims of a Mississippi River steamboat explosion, peasants and at least one wily politician, all crammed into a single block. 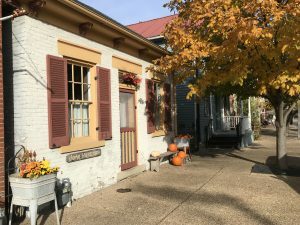 Aside from exploring the town on foot or touring the historic homes, there is so much to enjoy in St. Genevieve! The French brought winemaking to the St. Genevieve area in the early 1700s. The Germans added to that culture in the 1800s. Now, the Route du Vin Wine Trail is only one of several wine trails in Missouri which includes six wineries from St. Genevieve to Farmington, Missouri. Four times each year, (January, February, April and November) the Wine Trail offers special events. You can take a river ferry from St. Genevieve to southern Illinois. The Ste. Gen-Modoc River Ferry operates year round and will take you to Fort de Chartres, the Pierre Menard Home and Fort Kaskaskia State Historic Park in Illinois. (stegenmodocferry.com). St. Genevieve is the most interesting and charming small town we have explored to date! If you are nearby, visit St. Genevieve before everyone finds out about it! This is a very special place!